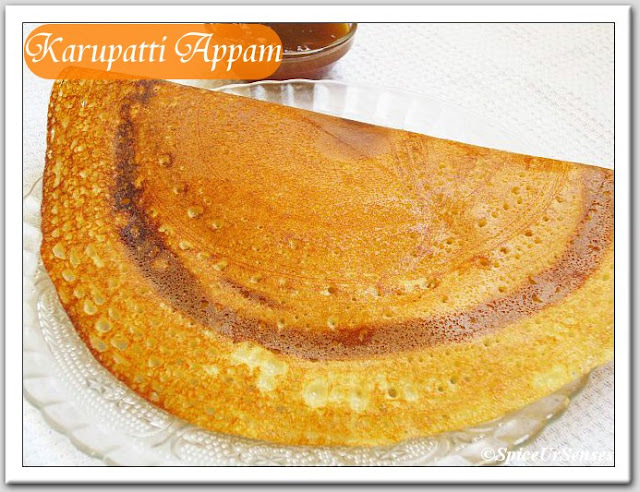 Karupatti Appam (Palm Sugar Appam) SNG Event For The Month Of April. I don't think so i have to say anything about this SNG event running by Divya Pramil of You too can cook Indian Food , because this event is very famous now. If any body want to join the group please click the link here. 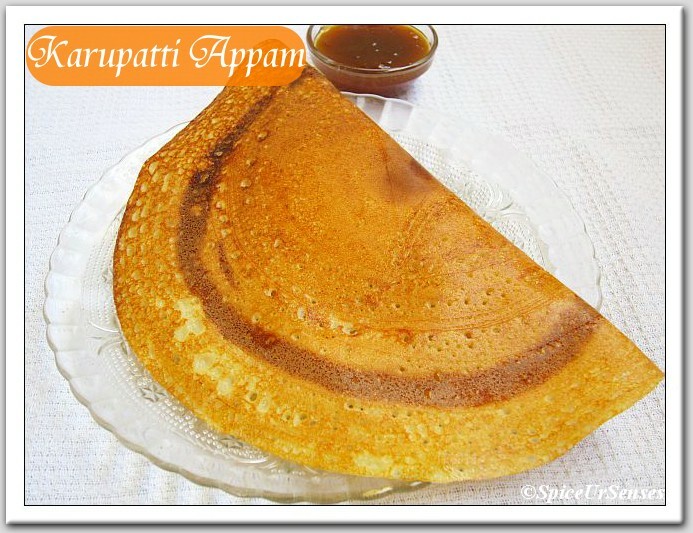 Karuppatti Appam. 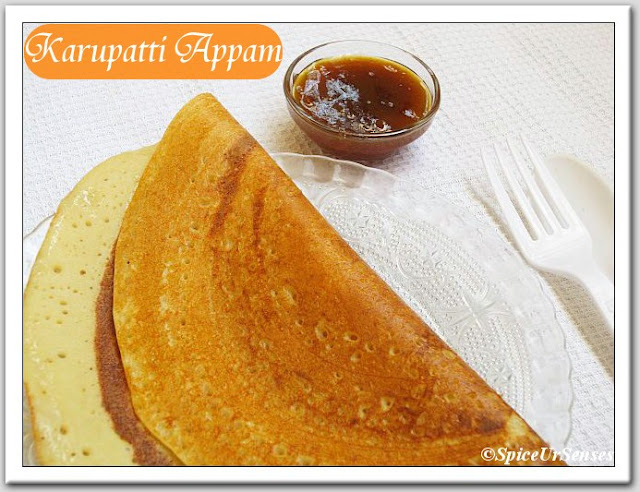 I have tasted this appam only once in Chennai and it was very delicious. After coming back from Chennai i totally forgot about it. When i saw in my email Karupatti Appam is a challenge for the month of April. All my old memory came back and i was very happy to cook this appam and serve it to my hubby, because he would be eating this appam for the first time and he loved it.... I should thanks to Shama from the Easy2Cook Recipe for giving this wonderful challenge and delicious recipe to learn..
Make thick palm jaggery syrup . Filter it and remove the impurities with a strainer once cooled. Soak rice and dal for only 2 hours and grind it to a very smooth batter. No fermentation needed. Finally , mix palm jaggery syrup with the batter without any lumps. Heat aappam tawa or any non-stick pan . Pour a small ladle of batter in the centre and then hold its handle with both the hands and rotate the kadai , hence the ladle will spread like a dosa. Spread a spoon of oil over it. Cover with a lid . Cook in slow flame till done . The centre part will be of and edges crispy . Just roll over and serve ho. Appam looks crunchy and perfect. Great job. It has come out super duper Rumana..osm job..
gud one Rumana. 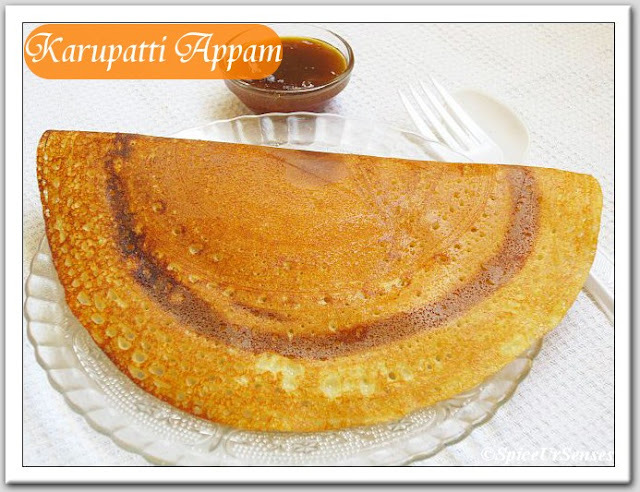 i do a similar one..but with leftover dosa batter, but thick consistency batter. so get it steamed. this luks divine! Ohh that was turned out so well. I tried that yesterday and mine was a bit lumpy..
Will make the batter again and try..great job ! Stunning, made to perfection and I can imagine the taste when pinched and nibbled on. Yum all the way. 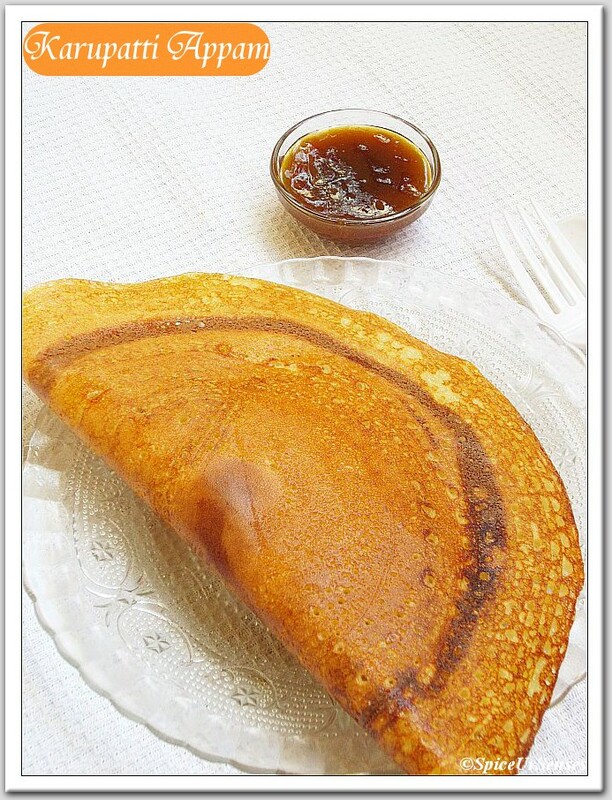 Dosa looks crisp and perfect.. Nice clicks.. Dosa looks so tempting.. I wish i could taste it..
Karupatti appam looks fabulous Rumana. Perfectly crunchy and delicious. Oh gal,you rock appam turned out extremely prefect dear..Lovely and wonderfully done. perfectly done...lovely ...happy to know , u enjoyed it. What a crispy and well made dosa. wow lovely u have made it nice and crispy its very diff to make but u made it beautifully.